Like all equations of supply and demand, the fees on a direct private transaction are the outcome of a negotiation. The structures bend and sway because no two deals are exactly alike and no two investors are exactly alike, causing fee arrangements to vary widely and creatively. To design a fair and solid fee structure on a direct deal, we must first know the nature of each type of fee, asking how much, when, and why. Underpinning the fee payment structure is the fee repayment structure, where a fifth and very important number, the ‘hurdle rate’, comes to counterbalance. Hurdle rate - the preferred rate of return is called ‘the hurdle’, usually 8% compounding annually, accrued on outflows, both initial investment and fees paid by the investor, which must be paid back to investors before a sponsor can earn any carried interest. Generally, unless ‘rolled’ or otherwise stipulated, all fees paid out by investors accrue the hurdle. The initial investment does, too. 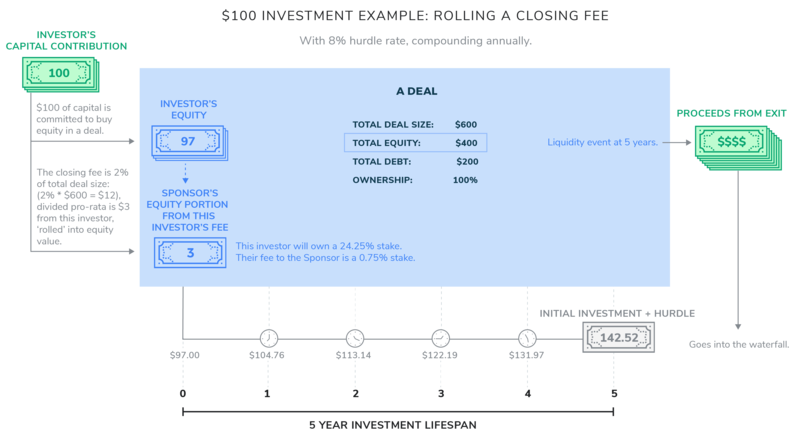 Upon the exit of a deal, the fee amounts and initial investment plus their preferred rate of return must be paid back to investors before the sponsor can participate in the upside. In other words, first make investors whole plus a baseline rate of return, then everyone can share the riches. A standard hurdle is 8% as an approximate benchmark for public markets, reasoning that investors invest in the private markets to beat public market returns. 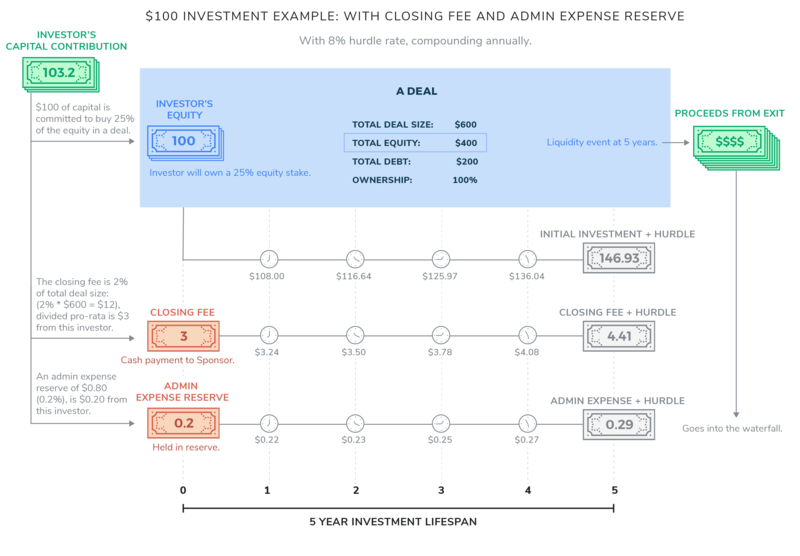 Let’s explore each type of fee on a hypothetical $100 investment, investing into a $600 deal with $400 equity and $200 debt. 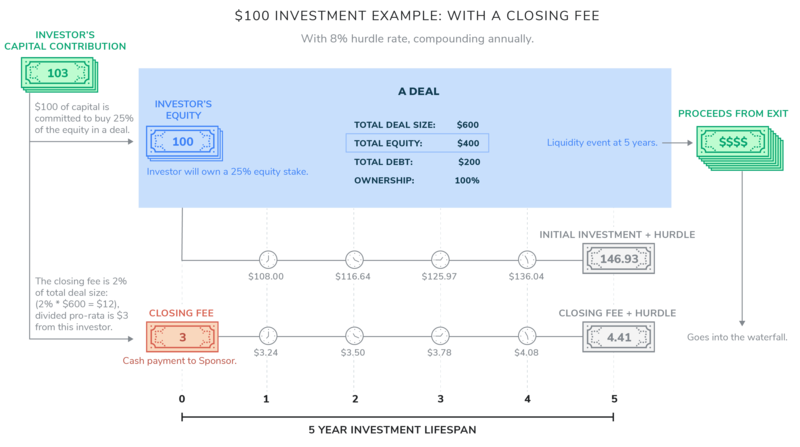 Closing fee, transaction fee, and deal fee are all synonymous words for the fees paid at closing by investors to the sponsor for getting an opportunity over the finish line. 1-2% of total deal size, often stated as a flat number and broken into expense reimbursement for the hard costs incurred and, secondly, compensation for their efforts in putting the deal together (this piece can be more pointedly called the ‘deal fee’). A deal fee in addition to expense reimbursement is especially common on deals without a banker, as the sponsor contributes extra value by finding the company through proprietary sources like personal relationships and not an auction. The mention of bankers brings us to quickly distinguish ‘banker fees’ as happening at closing on the other side of the table, usually paid by the seller (we see as the target company from the buy side) to the investment banks that are hired to help sell the owners sell the business, often through an auction process. Upon closing, when capital is deployed into a deal. To compensate for upfront work required to effect a transaction. Sponsors can spend years courting a company before convincing the founders and management team to move forward. In addition, the sponsor leads the diligence efforts to deeply understand the financials, operations, contracts, competitive landscape, growth prospects, and every other aspect driving the value of a business targeted for investment, incurring expenses at their own risk before a deal comes to fruition. From an individual investors’ perspective, it’s clear a dilution takes place. When they pay fees in cash, they paid an extra $3 but their stake was 25%. When the sponsor rolls their fees into equity, the investor pays $100 even in cash but their stake becomes 24.25%. A final consideration on closing fees is whether they apply also to add-on acquisitions. According to a study by Dechert and Prequin back in 2011 , 70% of firms charge closing fees for add-on acquisitions bolted onto an investment. These fee terms are typically predetermined in the original closing documents of the platform investment, so be informed. As it sounds, these are the annual costs to maintain the investment vehicle that are passed through to investors, including accounting, legal, entity fees to the government, and taxes. Should amount to no more than 0.10% to 0.20% of invested capital, will usually be stated in an absolute dollar amount with a hard cap. These are the plain vanilla costs every entity requires so they are mostly fixed, but complexity like investing internationally, having international investors, or handling a large number of investors, adds variability. Paid up front and held in reserve. Does typically accrue hurdle. Any remaining balance in the reserve is also paid back to investors at the conclusion of a deal. It’s just a cost of doing business. Management fees are the an annual fees paid to the sponsor for their role in managing, operating, or overseeing an investment. The management fee can be paid as additional cash from the investors based on an annual percentage of invested capital, or it can be paid by the operating company as a percentage of EBITDA. When it is drawn from the company, old fund terminology would call this a ‘monitoring fee’. In direct deals, EBITDA vs. cash from investors are seen as two methods for structuring the management fee, depending on the needs of the investment. If paid in cash by investors, 1.5-2% of invested capital each year for the first 5 years is common (remember, most funds charge a management fee on all committed capital, not just deployed — the beauty of directs is that management fee is only paid on capital that’s been put to work). Each year after is often a very reduced flat dollar amount, discounted by 80-90% of the original number, amounting to maybe 0.15%-0.25% of invested capital. If paid from the EBITDA of the portfolio company, anywhere between 2-6% annually of EBITDA is a familiar range. If paid from the company’s EBITDA, it’s most commonly distributed at the end of each year, sometimes quarterly. Take note that a management fee paid by the company will not accrue the hurdle rate to investors. However, if paid by investors, it may be all paid up front or at each year’s anniversary from the closing date. Usually, timing of the payment is a matter of whether the sponsor wants to manage capital calls. In the deal-by-deal market, it is not uncommon to see the management fee paid up front and held in the investment holding company’s bank account, transferring the appropriate amount to the sponsor each year accordingly, to avoid the repetitive yearly task of contacting investors. Whenever the fee payment is contributed by investors, the hurdle clock starts ticking. To “keep the lights on” at the sponsor’s entity, supporting operating costs and overhead as the sponsor oversees the investment. The sponsor will often provide ongoing board-level guidance and operational analysis to support the investment. We’ll add a typical case to our example: a 2% annual management fee for 5 years paid up front. These cover the standard fee types at closing and through the active life of a deal. The final share of economics is tied to the exit. Carried interest isn’t the icing on top, it’s the cake. In deal-by-deal investing, the other fees are meant to be crumbs. In contrast to the the fund world where management fees on billions of AUM will yield a significant number, in the deal-by-deal world, these only pay the bills. The real money is in the carry — arguably, as it should be. Carried interest, or ‘promote’, is the performance-based fee tied to the ultimate outcome of a deal. The sponsor earns a share of the profits, after the initial investment and fees plus hurdles are repaid. This compensation most closely aligns the interest of investors and sponsors because sponsors only profit when a deal makes money. The traditional quote in PE is “2 and 20”, referring to a 2% annual management fee and 20% carried interest. The pithy catchphrase has secured itself as a remarkably sticky pricing model in the fund industry. While it appears with frequency in the deal-by-deal world, it isn’t a standard. Each deal demands different levels of effort to bring to the table, build value, and exit. In a deal-specific discussion, those levers are easily adjusted. A lighter touch may garner “1 and 10”, while a deeply entrenched sponsor may offer a tiered structure, increasing their share based on their performance, “10 over 10, 20 over 20, and 30 over 30”, translating to 10% carried interest over a 10% IRR, 20% over a 20% IRR, and so on. Upon the exit of a deal as profits are divided for a final distribution to investors. Because no deeper alignment exists between the investor and the sponsor than tying incentives to the final outcome of profits. Little can be denied about the effect of carried interest upon the success of the entire private equity industry. The invention is largely responsible for drawing top talent into the industry and keeping it there. The carried interest calculation takes the lump sum upon exit and distributes the proceeds in priority to the investors and sponsors. To give a mental model to the math of profit distribution, PE calls it ‘the waterfall’. Think of it as a pool of cash draining over a cliff, flowing from top to bottom and stopping to distribute along the way to each party as due, continuing on with whatever volume is left in its stream. Waterfall - The tiered structure of payouts, as profits are apportioned at first preference, then flow down to the next tier and so on to the next. Waterfalls illustrate how various outcomes affect parties differently based on terms of preferred rates, catch-ups, and promote. Let’s imagine our deal exits after 5 years at a 3x MOIC (Multiple On Invested Capital). We know the hurdle rate is 8% compounding annually and we want to see how a 20% promote would be calculated. The last important piece is to know whether the terms are stipulated “with catch-up” or “without catch-up”. If the returns don’t beat the hurdle, investors won’t pay any performance fee. Because investors are paid first up to the hurdle, usually there is a clause to 'catch-up' the sponsor to matching participation in the waterfall. With catch-up or “full catch-up” - A provision that allows, after the hurdle is paid to investors, to 'catch up' the sponsor to those preferred payments. If the sponsor has a 20% carried interest, this method will award the sponsor 20% of total profits. Without catch-up or “no catch-up” - The sponsor only participates in the pool of profits after the hurdle is paid. 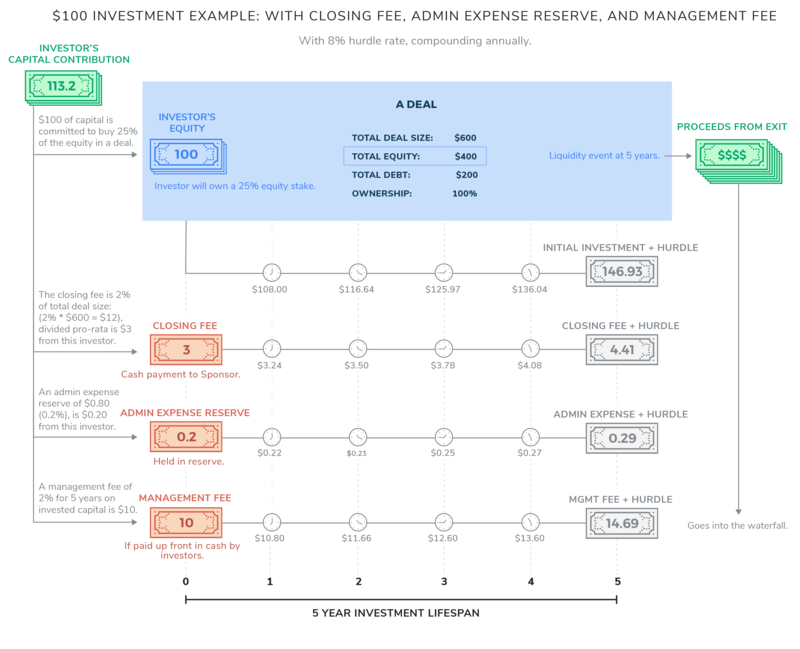 Because the pool is reduced by the amount paid for the hurdle to investors, the same 20% carried interest would be a lower overall profit share with this method. While we have surveyed PE fees, we can’t emphasize enough the importance of understanding the specific fees on any deal you decide to transact into. At the end of the day, figuring out the right fees and incentives for a deal is a big part of the dialogue that inevitably happens between investors and sponsor on any transaction. © 2018 Nextvest — This article is for general information only. The information presented should not be construed to be investment advice, solicitation, representation of any specific investment, or to predict future performance. Investing involves risk, including the potential loss of principal. No investment strategy can guarantee a profit or protect against loss in periods of declining values. Past performance does not guarantee future results. Opinions expressed are subject to change without notice. This information is designed to provide general information on the subjects covered; it is not, however, intended to provide specific investment, legal, or tax advice. Always consult your own attorney and financial professional before making any investment decision.